Welcome to Bayview. 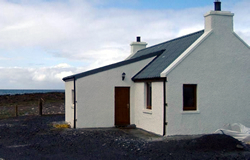 Bayview is our holiday cottage, an old fisherman’s cottage that has been refurbished to an extremely high standard and is available to hire on the Scottish island of Benbecula. The island of Benbecula is located between the islands of North and South Uist in the outer Hebrides. Benbecula features miles of beautiful white, sandy beaches. The Uist islands boast some of the most beautiful unspoilt beaches in Europe. Bayview cottage sleeps 4 people. It consists of 1 bedroom with twin beds, wardrobe, drawers, alarm clock, and reading lights. The living room has a large corner sofa, which converts into a top of the range double sofa bed in less than 1 minute. There’s also a multi-fuel stove, freesat TV/DVD combi, DVD’s, radio and cd player, playing cards and info leaflets. Dogs are allowed but cost an extra £10 per week. All bedding, towels and electricity is included in the price.